The NASA crawler-transporters are the largest land transport vehicles in the world. 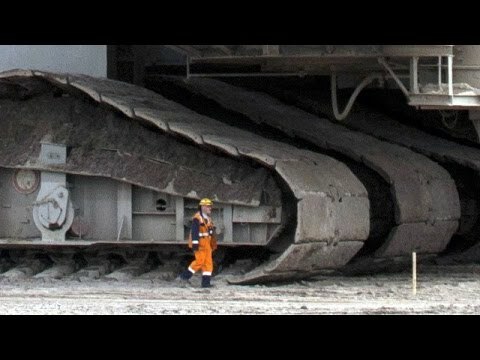 Each crawler weighs about 2.7 million kilograms or about 6 million pounds. They are 40 meters or 131 feet long and 35 meters or 114 feet wide. Built in 1965 at a cost of 14 million US dollars each, the 2 crawler-transporters are actually nicknamed “Hans” and “Franz”. And what absolutely magnificent works of design and engineering they both are – these massive machines and their combined 8 thousand horse power engines have smoothly and faithfully carried all the Saturn V rockets and all the Space Shuttles the 5 mile journey from the Vehicle Assembly Building to the Launch Pad. And in fact between the 2 of them they have travelled more than 3,400 miles in total, that’s about the distance from Miami to Seattle. Big Bertha is the world’s largest tunnel boring machine… and here she is in 41 pieces leaving Osaka Bay Japan on route to the United States of America. The 80 million dollar 57.5 foot diameter Bertha was designed specifically for the SR99 Tunnel Project commissioned by the Washington State Department of Transportation. Named after Seattle’s only Female Mayor, Bertha Knight Landes, the massive machine Bertha is 326 feet long and weighs 7,000 tons or 14 million pounds. And as she winds her way under Seattle, Bertha will chew through approximately 35 feet of rock and soil each day. She will also, using her giant pair of arms, automatically erect and seal thousands of concrete panels as she goes. She is simply incredible, and is surely one of the greatest machines ever devised. At 738 feet long and towering 315 feet high, this gigantic contraption weighs 14,200 tonnes or about 31 million pounds. Powered by enough electricity to sustain a medium sized town, each of Bagger 293s 20 buckets can hold about 80 bathtubs worth of dirt, meaning it can move about 8.5 million cubic feet of earth per day. … to put that in perspective, that’s the equivalent of digging a really, really big hole…. and to be more precise… that’s about the size of digging a football field 30 meters or about 100 feet deep, in a single day. If you want buy one of these monstrous mechanical marvels, you’ll need at least 100 million US dollars and a crew of 5 to drive it… but you won’t have to worry about speeding tickets, as this Big Bopper has a top speed of only 0.9 kilometres per hour. Japanese Saw V.S. Western Saw - Which Cuts Faster?